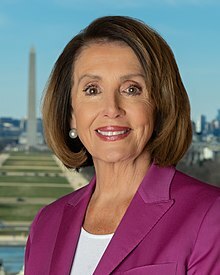 Nancy Patricia D'Alesandro Pelosi (born March 26, 1940) is the Speaker of the United States House of Representatives since January 3, 2019, and also served as Speaker from 2007 to 2011. She represents the 8th district of California, which is part of the city of San Francisco. She was first elected to Congress in 1987. Pelosi is a member of the Democratic Party. She is the first woman to lead a major party in the United States Congress. She is also the first woman and the first Italian-American to be the Speaker of the House between 2007 and 2011. Her father, Thomas D'Alesandro, Junior, was Mayor of Baltimore, Maryland and served five terms in Congress. Her brother, Thomas D'Alesandro III, also was Mayor of Baltimore. Pelosi graduated from Trinity College in Washington, D.C. in 1962. She and her husband, Paul Pelosi, who is from San Francisco, have five children: Nancy Corinne, Christine, Jacqueline, Paul and Alexandra, and five grandchildren. ↑ Hickey, Walter (August 23, 2012). "The 15 Richest Members Of Congress". Business Insider. Retrieved January 31, 2017. This page was last changed on 6 April 2019, at 04:53.